The rotational rate of one of the most massive black holes in the universe has now been measured very accurately by an international team of astronomers, using more than two dozen optical telescopes and NASA’s space based SWIFT X-ray telescope. The rotational rate of this massive black hole is one third of the maximum spin rate allowed in General Relativity. This 18 billion solar mass heavy black hole powers a quasar called OJ287 which lies about 3.5 billion light years away from Earth. 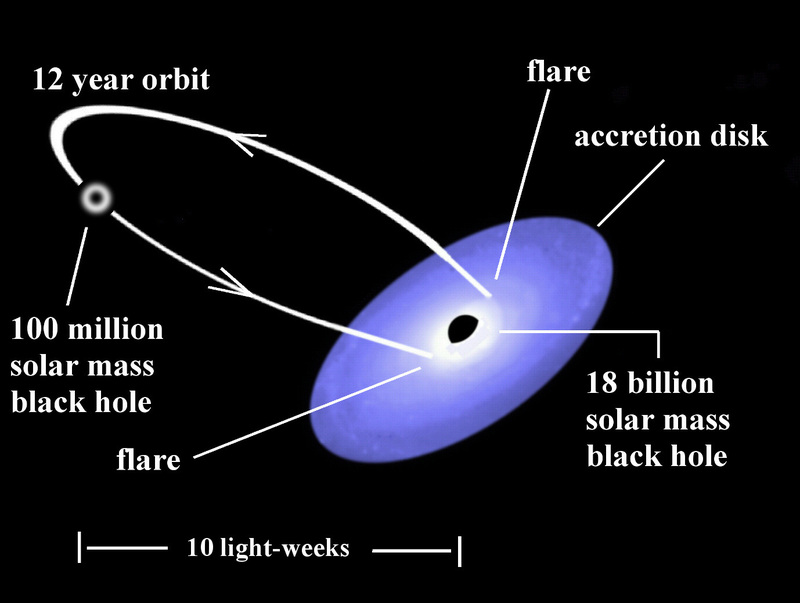 An illustration of the binary black hole system in OJ287. The predictions of the model are verified by observations. Image Credit: Gary Poyner, UK. A recent observational campaign involving more than two dozen optical telescopes and NASA’s space based SWIFT X-ray telescope allowed a team of astronomers to measure very accurately the rotational rate of one of the most massive black holes in the universe. The rotational rate of this massive black hole is one third of the maximum spin rate allowed in General Relativity. This 18 billion solar mass heavy black hole powers a quasar called OJ287 which lies about 3.5 billion light years away from Earth. Quasi-stellar radio sources or `quasars’ for short, are the very bright centers of distant galaxies which emit huge amounts of electro-magnetic radiation due to the infall of matter into their massive black holes. This quasar lies very close to the apparent path of the Sun's motion on the celestial sphere as seen from Earth, where most searches for asteroids and comets are conducted. Therefore, its optical photometric measurements already cover more than 100 years. A careful analysis of these observations show that OJ 287 has produced quasi-periodic optical outbursts at intervals of approximately 12 years dating back to around 1891. Additionally, a close inspection of newer data sets reveals the presence of double-peaks in these outbursts. These deductions prompted Prof. Mauri Valtonen of University of Turku, Finland and his collaborators to develop a model that requires the quasar OJ287 to harbour two unequal mass black holes. Their model involves a massive black hole with an accretion disk (a disk of interstellar material formed by matter falling into objects like black holes) while the comparatively smaller black hole revolves around it. The quasar OJ287 is visible due to the slow accretion of matter, present in the accretion disk, onto the largest black hole. Additionally, the small black hole passes through the accretion disk during its orbit which causes the disk material to heat up to very high temperatures. This heated material flows out from both sides of the accretion disk and radiates strongly for weeks. This causes peaks in the brightness, and the double peaks arise due to the ellipticity of the orbit, as shown in the figure. The binary black hole model for OJ287 implies that the smaller black hole’s orbit should rotate, and this changes where and when the smaller hole impacts the accretion disk. This effect arises from Einstein's General Theory of Relativity and its precessional rate depends mainly on the two black hole masses and the rotation rate of the more massive black hole. In 2010, Valtonen and collaborators used eight well timed bright outbursts of OJ287 to accurately measure the precession rate of the smaller hole’s orbit. This analysis revealed for the first time the rotation rate of the massive black hole along with accurate estimates for the masses of the two black holes. This was possible since the smaller black hole’s orbit precess at an incredible 39 degrees per individual orbit. The General Relativistic model for OJ287 also predicted that the next outburst could occur around the time of GR Centenary, 25 November 2015, which marks the 100th anniversary of Einstein's General Theory of Relativity. An observational campaign was therefore launched to catch this predicted outburst. The predicted optical flare began around November 18, 2015 and reached its maximum brightness on December 4, 2015. It is the timing of this bright outburst that allowed Valtonen and his co-workers to directly measure the rotation rate of the more massive black hole to be one third of the maximum spin rate allowed in General Relativity. In other words, its Kerr parameter is accurately measured to be 0.31 and its maximum allowed value in General Relativity is one. In comparison, the Kerr parameter of the final black hole associated with the first ever direct detection of gravitational waves is only estimated to be below 0.7. The observations leading to accurate spin measurement have been made due to the collaboration of a number of optical telescopes in Japan, South Korea, India, Turkey, Greece, Finland, Poland, Germany, UK, Spain, USA and Mexico. The effort, led by Staszek Zola of Poland, involved more than 50 astronomers from these countries. Interestingly, a number of key participants were amateur astronomers who operate their own telescopes. Valtonen’s team that developed and contributed to the spinning binary black hole model include theoretical astrophysicist A. Gopakumar from TIFR, India, and Italian X-Ray astronomer Stefano Ciprini who obtained and analyzed the X-ray data. The occurrence of the predicted optical outburst of OJ287 also allowed the team to confirm the loss of orbital energy to gravitational waves within two percent of General Relativity's prediction. This provides the first indirect evidence for the existence of a massive spinning black hole binary emitting gravitational waves. This is encouraging news for the Pulsar Timing Array efforts that will directly detect gravitational waves from such systems in the near future. Therefore, the present optical outburst of OJ287 makes a fitting contribution to the centenary celebrations of General Relativity and adds to the excitement of the first direct observation of a transient gravitational wave signal by LIGO.